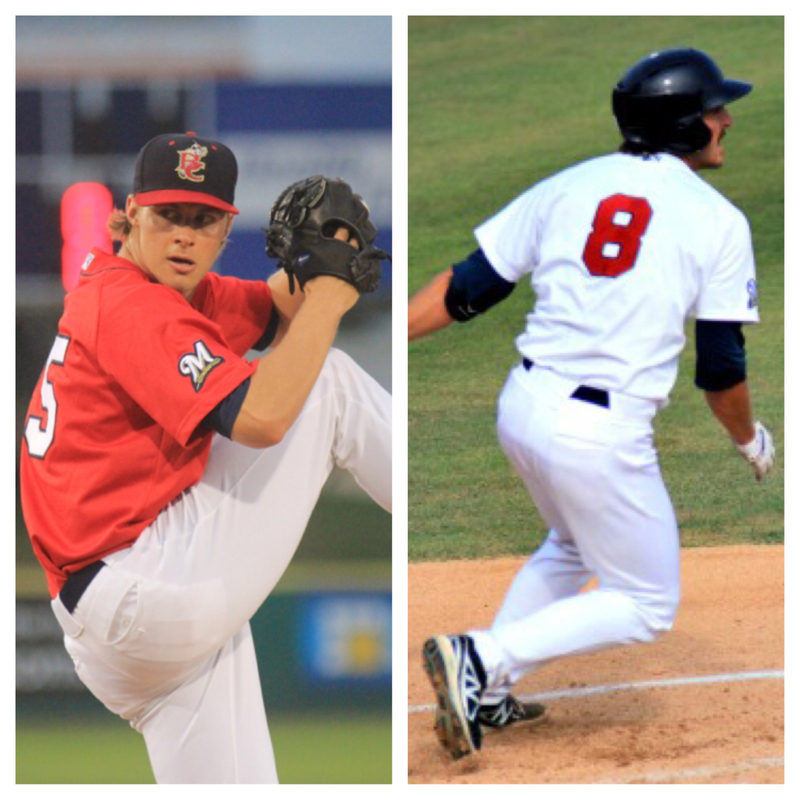 LHP Jed Bradley (left) and C Parker Berberet (right) paced the Manatees in a 7-5 win over Tampa on Sunday. In the 1990’s and early 2000’s the Houston Astros were noted for having the “Killer B’s”. Craig Biggio, Jeff Bagwell, Derek Bell, and Lance Berkman were key pieces on some talented Houston teams. On Sunday night, the Manatees rallied behind their own “Killer B’s” to defeat Tampa. Both Jed Bradley and Parker Berberet put together strong outings in Brevard’s 7-5 victory in what was a historic night for both players, but for different reasons. When rosters were released in the days leading up to the season, it came as a surprise to some that Jed Bradley was returning to Space Coast Stadium for a third consecutive season. After dealing with some rocky performances and a slew of injuries in the past, Bradley came to Viera a new man in 2014. The left-hander tied Jorge Lopez for the team lead in victories on Sunday with five. Bradley surrendered just two runs into the seventh inning, but tired in that final frame. The lefty finished the day with five runs allowed (four earned) on nine hits in 6.1 innings of work. Control, which had been a problem for Bradley in his first two pro seasons, was not an issue for him on Sunday. He issued just one walk compared to six strike outs. For the year, Bradley has issued just 10 free passes, while striking out the second-most batters in the Florida State League (53). Unlike any start Bradley has had in the past, the best part of his day came when manager Joe Ayrault removed him from the ball game. As the left-hander handed the ball over to his skipper, Ayrault turned and told him the news he had waited almost two and a half years to hear. He was going home to Double-A Huntsville. After a rough first outing against Daytona on April 5, Bradley was a revelation for the team. In his final nine starts with the club, Bradley went 5-1 with a 2.08 earned run average. Over that stretch, the former Georgia Tech product received the FSL Pitcher of the Week Award twice and had two of the most impressive outings of his career. On May 20, Bradley threw nine innings of four-hit, shutout baseball in a no-decision against the Palm Beach Cardinals. As well, he struck out a career-high nine batters against the Daytona Cubs on April 27. If not for the efforts of his backstop, Parker Berberet, Bradley may not have won his final start with the Manatees. Berberet, who has received limited playing time this year due to the success of Cameron Garfield, has been on an absolute tear over the last few days. In his last three games, dating back to May 22, Berberet has picked up at least one hit in every outing. In all three of those games, Berberet has recorded at least one double and one RBI. However, Sunday night’s performance was the high mark for Berberet’s season. Starting back-to-back games for the first time all year, Berberet tied a career-high with four base-hits in the win over the Yankees. The catcher lined two doubles to right, singled twice, stole a base, scored and drove in a run. Over the two games he has played during this homestand, Berberet has yet to be retired (6-for-6 at the plate) with three doubles, three runs scored and two RBI. ‘Tees Tidbits: Due to a virus that has ravaged the Manatees clubhouse, the team has been extremely short-handed over the last few days…Brevard County only had nine position players and two pitchers (excluding Bradley) available during Sunday’s ballgame…In order to aid the depleted bullpen, RHP Mark Williams was transferred to the roster from Class-A Wisconsin…1B Garrett Cooper, who had has played since May 20 with flu-like symptoms, was placed on the disabled list to make room on the roster for Williams…With Bradley’s departure, the ‘Tees roster currently sits at 24, one below the FSL limit.